Due to recent events I outline here the reasons why I generally do not recommend to book (and spend) a vacation in Mexico in resort facilities. Of course, all of the facilities are big employers in the region. The jobs that are assigned among locals are more these jobs which do not require long-term training or they receive their training in the course of the employment relationship (training on the job). These are serving staff, cleaning staff, garden assistants. Many of the positions in the higher income classes are either occupied by Mexicans who have been transfered within the hotel chain and an above average percentage of the higher management are foreigners. Now, let’s imagine, there would be many small hotels that would have the same number of beds and capacity. Would the structure still be like thatß I think, from the economic point of view, tourism can be promoted and at the same time the region with its inhabitants, if we do not rely on international groups, but support small and family businesses. Presentation of food as buffets and the all-inclusive strategy with all beverages for free convey the impression that food and drinks are in abundance and can be wasted. With buffets more food is thrown away than through a normal ordering service, since the cooling chain must be strictly adhered to in our tropical climate in order to prevent food poisenings. The premises are all very nicely designed and resemble a huge tropical garden. This is deceptive of the fact that they are artificial gardens and that true nature is banned. For many hotel facilities, mangrove and wetlands were dried out, sand was shifted on the beaches and cenotes were covered, wildlife animal on the property are often poisened. However, the biggest reason I reject to recommend to book a holiday at one of the resort, as many of them have a dolfinarium, a swim with dolphins program on their property. 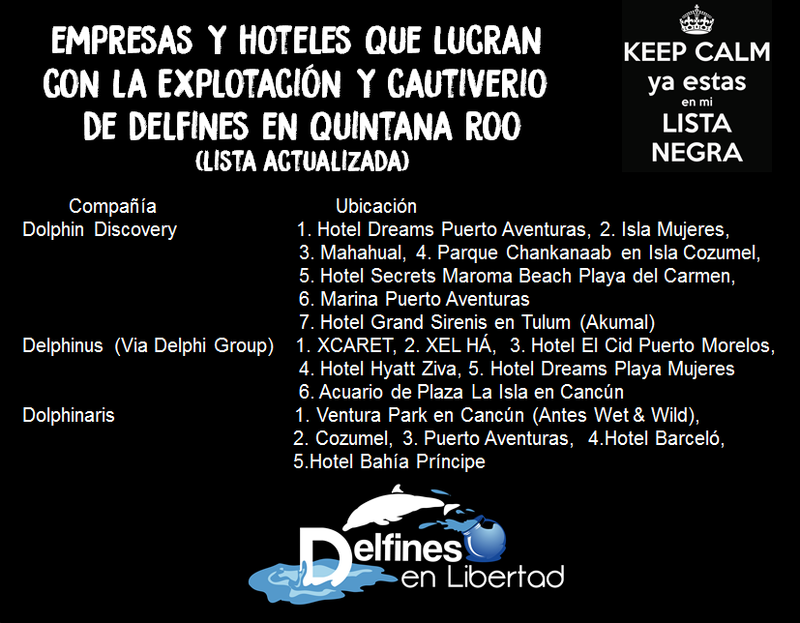 A study of Delfines in Libertad in 2015 estimates that the number of facilities with dolphin in captivity in Mexico is 29, and 20 of them are in Quintana Roo alone. Since 2008, 11 new facilities have been added (in all of Mexico) and this is of course because the tourists create the needs. If you have not already known before, I would like to point out the connection between dolphins and capturing wild dolphins (Taji or Faroe Islands and Solomon Islands) and the catastrophic conditions in which the dolphins are kept (too small pools, water with chlorines, no shadows and too shallow pools). Dolphins swim in freedom up to 150 km and are highly social beings. I uploaded the complete study here (in English). For the sake of completeness, I mention here that I do not want to support any of the dolphin activities that are not affiliated with any hotel nor any of the dolphin parks such as Xcaret, Xel-ha, Dolphin Discovery, Delphinos or Dolphinaris. The many variations in colouring and body shape has made this fish very popular in aquaristics. There are many cultivated species and even specialists only agree that they disagree about the correct systematology (page 22, as above). “Early” and “late” males means that sexual maturity is not dependent on a specific age or size, there are males that mature very early and from then on do not grow a lot anymore and there are significantly bigger specimens. Originally I identified the pictured species as Poecilia sphenops, however, comparing pictures of a photographer (and freshwater fish expert) that has been the same day at the cenote has shown that this is Poecilia orri (the mangroves molly). I would not have found that out based on environment as there are no mangroves in this cenote and the halocline between fresh and saltwater starts only at 16 m way back in the dark areas of this cave system. The picture displays a female on the left side and a male on the right. Pet cemetery ist a very unique cenote. I had the honor to be guide as well as actor in Jonathan Blue World’s Series. Jonathan Bird came here in 2010 and filmed the Blind Cavefish in cenote Pet Cemetery. See the results here. The family Stygiomysidae was proposed by Caroli (1937) for an unusual new genus and species of mysid. Stygiomysis hydruntina from caves on the Salentine Peninsula, the “heel” of the Italian “boot”. Caroli gave a brief description of the male of his new mysid, stating that a more detailed study would be published later. The fuller description never appeared, however, and S. hydruntina remains inadequately characterized. The prefix Styg- means that these animals live in caves completely submerge and absent of any light. As of today, the total number of Species in that Genus that are described at seven and all are stygobitic (see more information on the page of Dr. Thomas Iliffe). At the QRSS page you find the additional information that there are a total of four Stygiomysis sp. that reside in the underwater caves of Quintana Roo. These animals do not swim within the water column – as do the rest of anchialine critters. Species of stygiomysids are “crawlers”, preferring rocks, walls, and the ceiling of their stygian habitat. Cave divers often dislodge these animals from a cave ceiling with their exhaust bubbles, and misidentify the animal as Speleonectes tulumensis (Remipedia) as it happened to me very recently. Look for their square “head”.This was clearly a sign to distinguish for me, however, I also have them documented to do a bit of a swimming. The Black Vulture is a scavenger and feeds on carrion, but will also eat eggs or kill newborn animals. In areas populated by humans, it also feeds at garbage dumps. It is found in moist lowland forests and has therefore here an abundant distribution. It is usually seen soaring or perched on fence posts or dead trees. The Black Vulture lays its eggs on the ground in a wooded area, a hollow log, or some other cavity, seldom more than 3 metres above the ground. It is known to regurgitate when approached or disturbed, which assists in predator deterrence and taking flight by decreasing its takeoff weight. Like all New World Vultures, the Black Vulture often defecates on its own legs, using the evaporation of the water in the feces and/or urine to cool itself, a process known as urohidrosis. 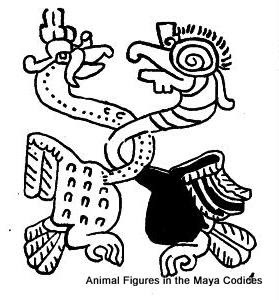 The Black Vulture appears in a variety of Maya hieroglyphics in Mayan codices. It is normally connected with either death or as a bird of prey. The vulture’s glyph is often shown attacking humans. This species lacks the religious connections that the King Vulture has. The mexican term for the black vulture, Zopilote, comes from nahuatl the language of the Aztecs (tzopilotl; “tzotl” means dirt and “pilotl” hang or carry referring to the way they carry the carrion while flying. A very common guest of our cenote parking spaces is this Ctenosaura similis, the black (spiny-tailed) iguana. They are native to Mexico and more southern countries, but have been introduced into Florida. It is the largest of the species and can run quite fast. Normally they are not shy and already used to the humans as they learn quickly to pick up the bread they get offered. They are diurnal – active during the day – and normally have a diet of fruit, flowers, leaves and occasionally some smaller animals. It is not endangered and is even considered food and hunted therefore in some countries. True crabs are distinguished from other so called crabs because they have a very short tail only which they sometimes also fold unter their body. The list of inhabitants of the Cenote logbook of the Riviera Maya names is as Blue Crab (Cardisoma guanhumi) a species that lives only on land, however, based on fotographic comparisions and descriptions I identify this as Calllinectes sapidus, commonly known also as blue crab. I call her dancing grab because this crustacean has a very territorial behaviour that is quite funny to look at. If you dive slowly closer, they start to wave the last pair of legs from left to right as if they hear some music. This pair of legs is flattened and normally used for swimming. It is said that the blue crab is quite common on the golf of Mexico, but the only place known to me so far is Casa Cenote close to Tulum. Olgibia pearsei is the top predator in the Mayan Blue Cenote system and probably fulfils the same position in other locations (Pohlmann, Iliffe and Cifuentes, 1997; Pohlmann, Iliffe and Cifuentes, 2000). At least four species of troglobitic shrimps, Typhlatya mitchelli, T. campecheae, T. pearsei (Crustacea, Decapoda, Atyidae) and Creaseria morleyi (Crustacea, Decapoda,Palaemonidae) inhabit the subterranean waters of Yucatan (Hobbs and Hobbs, 1976; Holthuis, 1977) and these may form part of the food supply of the cave fishes. Reddell (1981) records other aquatic fauna from this area.